Of the many ethnic groups that the Russian people had contact with throughout their history, it may be the Germans with whom the relationship was the most intense. Take a look at the cozy area around Baumanskaya metro station in Moscow, leaf through a Russian-language dictionary paying special attention to etymologies, or look up the family origins of a multitude of political figures and men of science throughout Russian history, and there’s little doubt — German infl uence on Russian history and culture cannot be underestimated. Our history books devote quite a number of pages to Germany, which graciously provided us with several rulers. Consider that from the time of Peter the Great in the first quarter of the 18th century up to the demise of the Romanov Dynasty in 1917, only two emperors were actually Russian — Peter himself and his daughter, Elizabeth. The last Romanov tsar, Nicholas II, was only 1/28 Russian and largely of German ancestry. And it is worth noting that even the full-blooded Russian Peter the Great contributed to the bond between the two nations: During his childhood in Moscow, Peter spent a lot of time at Nemetskaya Sloboda, a German settlement near the Kremlin, which was one of the influences that later inspired him to bring about his famous Westernizing reforms. However, this close relationship between the two nations has never been simple. 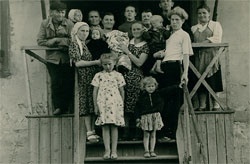 On the Russian side, there were periods of great admiration and even adoration that alternated with feelings of resentment and eagerness to blame Russia’s problems on the “invaders.” Some Germans have been praised, even canonized, like Fyodor Gaaz, while others, such as ethnic Germans living in the Volga region on the eve of World War II, were accused of treason and sent to Siberia. These extremes aside, the German presence in Russia over the centuries has been so voluminous that it comes as little surprise to find out that your friend or neighbor is of German origin and might even be in possession of a family archive. Such was the case with me. 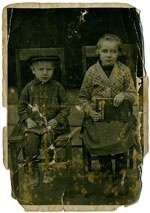 I am the lucky heir to a collection of faded, worn black-and-white photographs dating back to the 1930s, made in Russia and signed in German. The pictures came from my grandmother, who was a member of the large ethnic German population that settled near the Volga River in Saratov. The German presence in that area is immediately apparent through the Lutheran churches and clearly German architecture of the houses. Today the churches and the villages they served are silently deteriorating. Though Saratov is hardly the only German enclave in Russia, it was once one of the largest. Starting in the 10th century, German communities appeared in Astrakhan, Altai, and Moscow. In the 18th century, the already established practice of inviting German scientists, diplomats, and artists to come to Russia gained momentum, and many of these people remained in Russia with their families. However, the most signifi cant wave of German immigration to Russia took place a bit later. In 1763, Catherine the Great, who was of entirely German ancestry, proclaimed that foreigners were welcome in Russia and introduced incentives, such as exemption from taxes, to draw them here and help them prosper. Catherine’s plan worked — within a couple of years, some 8,000 German families had arrived to settle in all corners of the vast Russian territory. Communities grew rapidly in St. Petersburg, Siberia, Crimea — even in faraway Uzbekistan, where German settlements appeared a bit later. By 1913, there were nearly 2,400,000 ethnic Germans living on the territory of the Russian Empire, with the largest community concentrated in the Volga region, which would eventually enjoy the status of an autonomous socialist republic. There were, of course, less harmonious periods for ethnic Germans living in Russia. 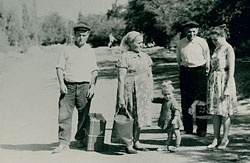 As previously mentioned, the advent of World War II brought suspicion of local Germans, who were evicted from their homes in the Saratov region and exiled to Siberia. In 1941 the German Autonomous Socialist Republic ceased to exist. Upon relocation, all able-bodied males of German origin were enlisted in the war effort and sent to work in various parts of the country. When the long-awaited victory came, their families, who had remained in Siberia, were free to join their husbands and fathers, which a great many of them did. In the 1980s, German Chancellor Helmut Kohl invited Russians of German extraction to return to their ancestors’ land, and many accepted the invitation. It is in part for this reason that Russian can often be heard on the streets of German cities. Perhaps surprisingly, even during the atheistic Soviet era, Germans always celebrated Christmas — both Christmases, in fact: the Lutheran, which falls on December 25, and the Orthodox, which they observed together with those Russians who kept their religion. “Sure, we never advertised it. But we put up our Christmas tree in time for the 24th of December and kept it until the Orthodox Christmas was over.” Moreover, Germans oft en gathered in their houses to read the Bible and other books that had been brought from Germany. 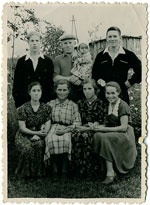 Despite living among Russians, Germans managed to stick to their traditions and beliefs. The ability to preserve these strong connections may have been partly a function of their communities, which were close-knit, closed to outsiders, and very supportive of their members. “Only aft er the war was well over did it become possible to even think of marrying outside the German community. Before that, parents never allowed this to happen,” my grandmother comments. And I’ve discovered that there’s a great advantage of this withdrawal from the outside cultural environment: the many delicious recipes that my grandmother inherited as part of her upbringing and will pass on to me.